Yeouido Park is a popular park in the middle of a popular island in the middle of popular Seoul. All in all, that makes the basketball courts in the middle of the park a popular place to play. Where should you go to play basketball if you want to cut out all the frills and just play the game? The answer is Yeouido Park. It has several "courts" in the Culture Square section of the park. However, most of these courts are actually not courts. There are no boundaries, no lines, or any other markings that would represent a basketball court. There are only goals facing each other with pavement in between. 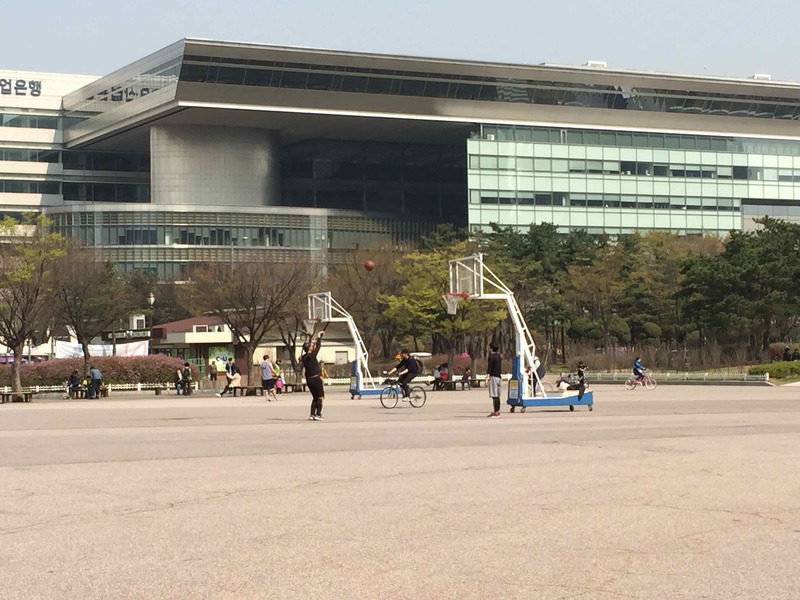 Even so, Yeouido Park is a very popular place for basketball. Very competitive pick-up games can be found on most weekends during the summer. There is one actual court in one corner of the square. This court has pavement that won't scuff up your ball and proper lines and markings on the court. Streetball-style. 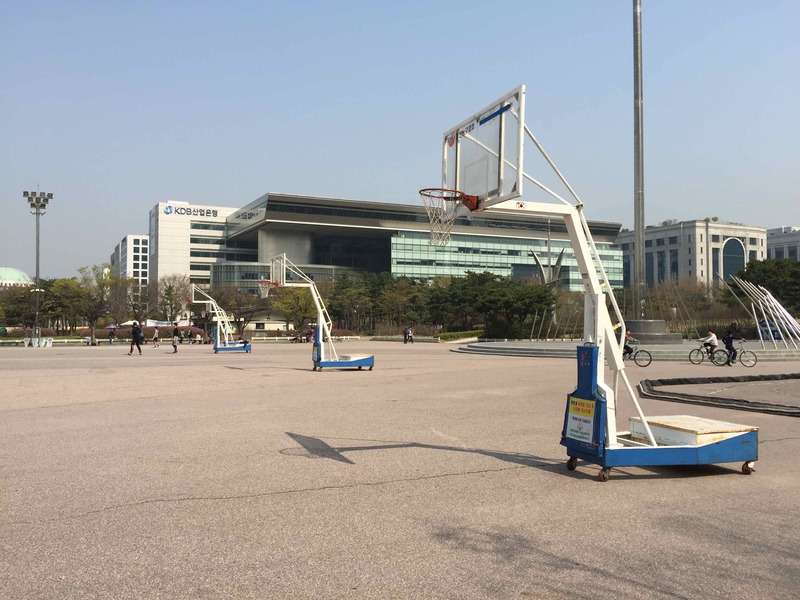 Without the goals facing each other, you wouldn't even know basketball was played here. The surface is asphalt pavement like that you'd find on a street. There are no boundaries or lines of any kind. The competition here is great. There are always games to be found, particularly in the afternoon on weekends. If you want to show off your stuff and impress the spectators, there are always onlookers nearby. There are no markings on the "courts". Since the courts are in the middle of a rather large slab of concrete, it can get pretty hot during the summer. A convenience store is next to nearby Yeouido Park Gate 6. It's an excellent place to grab a drink. 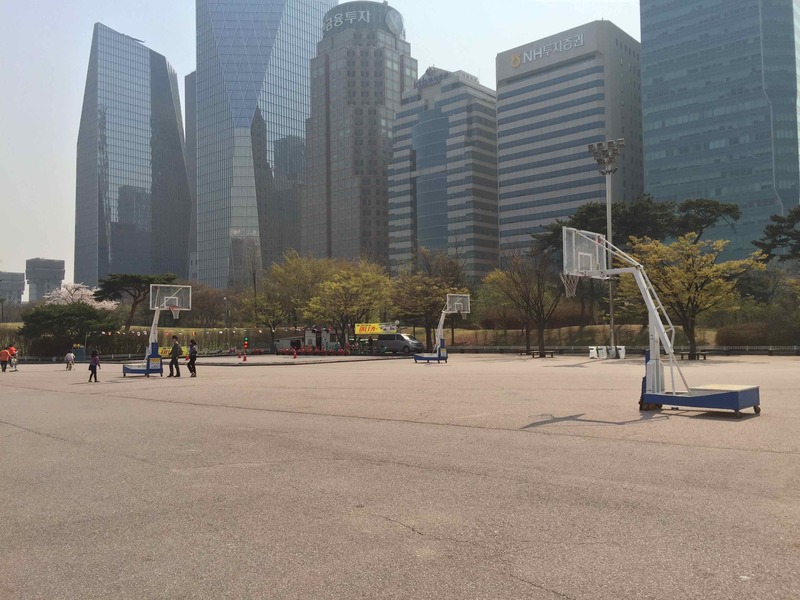 Check out the Yeouido Park photo album to see more pictures of the area. -Walk out of exit 2 or 3 and go straight for about 200 meters. 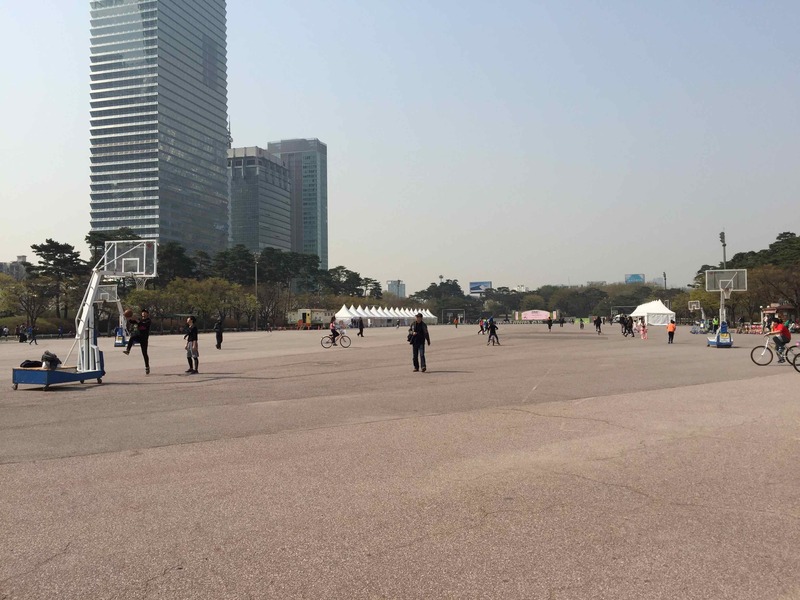 Enter Yeouido Park through Gate 1. The basketball courts will be directly in front of you. -Walk out of exit 3 or 4 and go straight for about 250 meters. Enter Yeouido Park through Gate 6. The basketball courts will be directly in front of you.